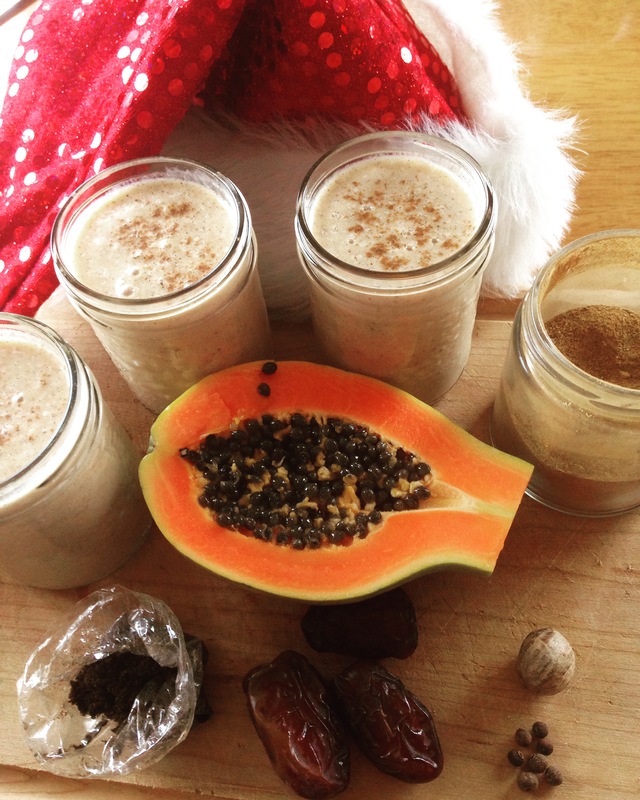 So far, this version of Raw Nog, is my Favourite recipe of the holiday season. It’s creamy, yummy, has all the holiday spices, and the papaya brings it all together to create a Healthy festive drink! Blend coconut and water until slightly warm. I use the neck test. Touch your neck and when your blender reaches the same temperature…it’s done! This instruction is for a high powered commercial blender. Add Dates and spices. Blend until smooth. Add Papaya and Banana and blend another 30 secs or until smooth. This entry was posted in Fully Raw Recipes, FullyRaw Desserts, Uncategorized and tagged 801010, be the change, dairy-free, dessert, fresh, fruit, fruitarian, fullyraw, gluten-free, healing, health, holiday, holiday drink, nutrition, organic, plantbased, raw, raw nog, rawfood, recipe, vegan, vegetarian. Bookmark the permalink.